To compare the oxygen usage, for a given level of blood oxygen, of the main delivery systems on the market, with a particular focus on the two demand regulator systems. Detailed comparisons of demand regulators are scarce. 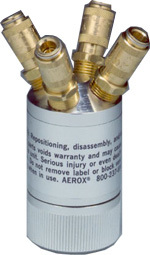 The main equipment vendors are Aerox, Mountain High and Nelson (Precise Flow). The last two offer demand regulators. Some background on oxygen systems is here. This article was originally written in December 2007, following the airborne test. 2. Oxysaver cannula. This has a reservoir under the nose where some oxygen is stored and it is claimed to reduce oxygen usage by about 2x. 3. Precise Flow (Nelson) demand regulator. This is a mechanical-only device which uses a conventional cannula which has two tubes going to the regulator, of which one delivers the oxygen while the other is used to detect (via the drop in pressure) the inhalation/exhalation cycle. The start of inhalation opens the oxygen flow and the start of exhalation closes it. The aircraft altitude is set manually using a rotating ring and this controls the size of an internal orifice. 4. Mountain High demand regulator. 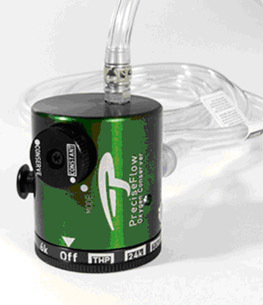 This is a range of similar products, which use an electronic (battery powered) box to control the oxygen flow. 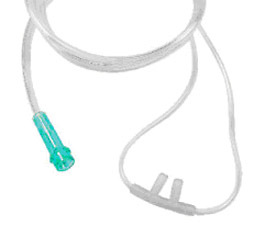 The cannula used is a conventional one with a single tube going to the regulator, and this single tube is used for both the detection of inhalation/exhalation and for the oxygen delivery. The regulator opens up the gas flow at the start of the inhalation cycle and shuts it off after a predetermined time (a fraction of a second, usually) which varies according to the aircraft altitude which is measured automatically using a built-in pressure sensor which senses the cockpit pressure. 5. Mask. FAA regulations (FAR 23.1447) require a mask to be used above 18,000 feet. No masks were tested in this report. Their oxygen usage is very high. 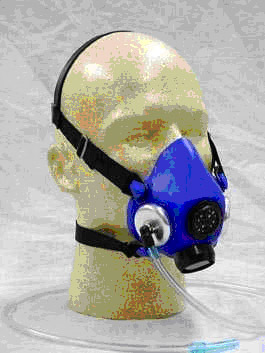 Masks are also available with a built-in microphone; the example below is from Draeger, marketed by Mountain High. It is difficult to establish a relationship between oxygen flow rate into e.g. a cannula and the resulting blood oxygen level, and any relationship achieved is also likely to vary from one person to another. Therefore, any meaningful delivery system comparison requires that an identical blood oxygen level is achieved in all cases. The big question is: where should this level be set? 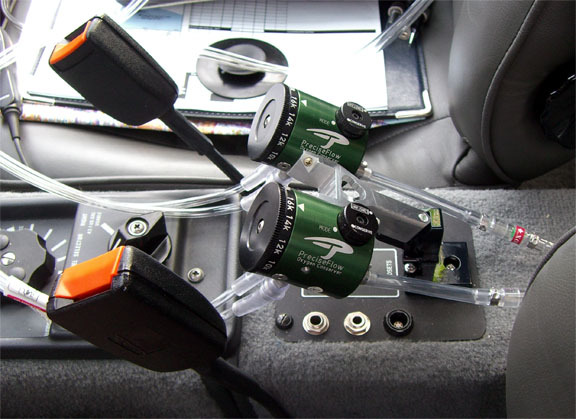 In this test, this question was pre-empted by the fact that the Mountain High electronic demand regulator measures the ambient air pressure (the aircraft altitude) and automatically sets the oxygen flow from that, and while this relationship can be modified using another operating mode, the default-function blood oxygen level (which was found to be 90%) is a reasonable value to aim for with all the other systems for the purposes of a meaningful comparison. Whether 90% is too low or just right is always open to debate but it seems to work well in practice. A level often recommended is to go no lower than 10 percentage points below the pilot's sea level figure, which is around 97-98% for most non-smokers. The next challenge was how to measure the amount of oxygen used. With a constant flow system one could use any suitably calibrated gas flowmeter - gas flow measurement is a well established disclipline. However, the demand regulators draw oxygen in bursts and it is the total mass of gas which needs to be measured, and this needs something more sophisticated. I tried to rent a suitable instrument which could be operated airborne - without success. So, a simple procedure was developed using multiple bottles which could be weighed on an accurate scale (KERN FCB6K1N, 0-6kg, 1g resolution) before and after the flight. The weight loss is simply equal to the mass of oxygen extracted. The tests were done using the aggregate usage of two pilots, for two reasons: to achieve a greater oxygen usage and thus improve the accuracy of the measurement, and to average out two people as this should yield a more representative result than measuring a single person who might have unusual physiology. Both pilots were males in good health, weighing 75-80kg, non-smokers. The tests were done in an unpressurised turbocharged aircraft at FL180. One pilot was flying the aircraft, which was on autopilot most of the time. The other was arranging the equipment and doing the measurements and timing. In each test, both pilots wore the same type of delivery system. FL180 was chosen for a number of reasons: The highest available controlled airspace base was FL195 and the only way to get into it would have been on a Eurocontrol IFR flight plan, and one cannot then do random flying around. 8.33kHz radio channel spacing is required above FL190. Lower levels, e.g. FL100, require much less oxygen and this would make delivery system comparison less significant. 3 bottles were used. One large 47 cu. ft. carbon fibre bottle was used for the climb and descent phases and for the constant flow cannula tests. Two more 13 cu. ft. aluminium bottles were used for the Mountain High and Precise Flow demand regulator tests. Care was taken to prevent blood oxygen depletion between tests, by arranging each test to start immediately after the previous one finished. Before the flight test, both aluminium bottles were weighed and re-weighed 12 hours later to make sure they were not leaking. Both pilots wore conventional cannulas, set to a flow rate which achieved at least 90% blood oxygen. This test was done first, to establish the blood oxygen level delivered by this regulator, using its default setting. The flow rate is set automatically according to altitude. The test ran for 19 minutes and the blood oxygen level quickly stabilised at 90%. Interestingly, it was very close to 90% for both pilots. Measured at 5 min intervals, the figures were 90,90,89,90 and 90,90,87,90 for the two pilots respectively. Another observation was that the breathing pattern (which naturally varies according to pilot activity) did not have much of an effect on the blood oxygen level. The objective was to achieve the same 90% blood oxygen as Test 1. As we were at FL180, the regulator was set to the "18k" setting and (perhaps suprisingly) this did actually deliver something close to 90% again. The test was 17 minutes long and the figures were 92,95,91 and 89,93,90. An immediate observation was that the blood oxygen achieved was significantly dependent on one's breathing pattern and a variation of 85% to 95% could be easily achieved by consciously breathing at very different rates. This was the model marketed by Aerox but it seems to be identical to the others on the market. The markings on the Aerox flowmeter were optimistic and the flow had to be set to considerably more than "18k" to achieve 90% blood oxygen. The markings on the flowmeter end at 18k for the Oxysaver cannula (probably because FAR 23.1447 mandates a mask at that level) and we used the "mask" scale to note down the flow rate. It took a while to determine the correct flow and it was found to occur at around 13.75k and 11.25k altitude setting for the two pilots respectively. These flow rates are way off the "oxysaver" scale and correspond to somewhere around 1.5x greater flow rate than the 18k Oxysaver value. At 5 min intervals, the blood oxygen values for the two pilots were 86,90,84,86,90,90 and 80,90,88,92,90,91. The blood oxygen value was found to be significantly dependent on one's breathing. A supplementary test was done with this cannula set to a flow rate of "18k oxysaver" which should have been correct but instead delivered poor values of blood oxygen. This test was not important since almost nobody would use a constant flow (non-Oxysaver) cannula, but it was immediately found that to get 90% one has to set the oxygen flow rate to around the "18k mask" level. The oxygen usage at this setting is much higher than the Oxysaver cannula. The resulting blood oxygen level is also very breathing dependent. This is also the setting which would be used for a mask. The aluminium bottles were weighed to directly determine the oxygen mass used up by the two demand regulators. The carbon fibre bottle had to be used for the climb and descent phases also and since it could not be re-weighed in the aircraft once level flight was achieved at FL180, the oxygen mass used by the constant flow cannulas was determined by running the gas out at the same flow indication (the ball in the flow indicator being in the same position) as it was during the flight. The aluminium bottles were used for this measurement because they have a flat bottom and can be more easily weighed. There was a possible error source in the above procedure. Due to the limited number of available bottles, the constant flow cannula oxygen usage was determined on the ground, by setting their flow indicators to the value seen during the flight, and letting the gas run out for the measured time, and weighing the bottle before/after. If the flow indicator (the tapered-cavity vertical ball type) is affected by the variation in the outlet atmospheric pressure (FL180 is about 500 millibars i.e. 50% of the sea level pressure) this could over-state the oxygen mass flow because at sea level the outlet pressure needs to be higher for the same mass flow rate. However, this possibility was virtually eliminated by a quick test involving feeding the outlet of the flow indicator into a cavity and then partially evacuating the cavity (to about 10,000ft equivalent altitude) and there was no significant change in the reading. Const. flow @ "18k Mask"
Note 1: There was a very slight deviation from 90% with both the MH and the PF tests. The MH readings averaged 89.5% and the PF readings averaged 91.7%. Had the PF regulator been set to a lower altitude (to achieve 89.5% too) it would have used less oxygen. Similarly, had the 1st stage regulator pressure been a little lower, the PF regulator would have also used less oxygen. It's reasonable to conclude that the 2.6 factor between the two is slightly overstated, but the difference amounts to just 2.2% in blood oxygen level which is well below any possible experimental precision. Note 2: The average blood o2 reading was 88.1%. Note 3: This setting produced blood oxygen figures of 86% and 80% for the two pilots. Note 4: This is how much a mask (or a constant flow non-Oxysaver cannula) would draw at FL180. The Precise Flow demand regulator is only 16% better in oxygen usage than a constant flow Oxysaver cannula. 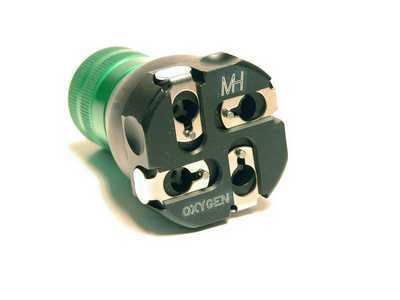 The Mountain High demand regulator is 2.6 times better in oxygen usage than the Precise Flow demand regulator. The constant flow Oxysaver cannula flow indicator markings are rather optimistic and the flow rate required for a reasonable level of blood oxygen needs to be set significantly higher. The oxygen requirement of FAR 23.1447 (local copy, 32k PDF) is not a simple specification and it is difficult to translate in into a straight oxygen flow rate requirement. The Mountain High (MH) system works correctly at FL180 on its default setting and achieves its 90% level in a manner which is relatively insensitive to one's breathing pattern. This is probably a good thing since the pilot's breathing will vary according to the task, stress levels, etc. In particular it was noted that a series of ATC instructions which need to be acted on reduces one's oxygen intake. The MH cannula uses a single thin tube which is less inconvenient than the other systems. The MH system uses simple push-fit connections which utilise the bare plastic tube ends, which are easy to connect/disconnect as required for different users for hygiene reasons. However, the MH system delivers short intense pulses which are noticeable inside the nose and are not as comfortable as the other systems. It also uses electrical power (external or batteries) and while there is ample warning of low battery status, the regulator will fail in the shut condition, cutting off all oxygen! The MH electronic regulator also implements an "anti hyperventilation policy" which prevents it dispensing the oxygen pulses at an excessive rate, so if one breathes very fast the oxygen is delivered on say every 2nd breath only. The brief oxygen pulse (whose duration is altitude dependent), delivered at the start of the inhalation cycle, means that drawing a long breath does not give you more oxygen. The Precise Flow (PF) system works correctly at FL180 using its standard altitude settings. It uses a lot more oxygen than the MH system but delivers it in a more comfortable manner, with no pulses noticeable inside the nose. One can just hear the hiss of the gas pulses. However, its dual-tube cannula uses a larger diameter tube than MH (about 2x larger) and this tube is a lot less flexible. 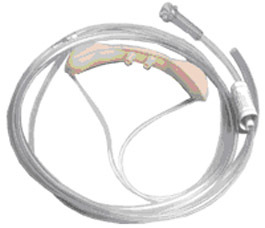 Its push-on connector system can require a considerable force (especially for removal) and is not suitable for frequent cannula changeovers. The PF demand regulator is a clever and purely mechanical device which controls the gas flow in a simple way: it uses the start-of-inhalation and start-of-exhalation points to open and shut the oxygen flow, respectively. If the pilot inhales and then holds his breath, or his exhalation is subdued, the PF system shuts off the flow very late which is clearly inefficient for saving oxygen. On the other hand, drawing a long breath does give you extra oxygen - the regulator stays open during the entire inhalation. If the cannula is removed from one's nose before exhaling (a 50% probability?) then the oxygen just keeps coming out indefinitely and is wasted! The MH system does not have this property and experimental data suggests that in the absence of breathing its total leakage is virtually zero. The PF demand regulator performance is confirmed by this table (1.3MB PDF) from Precise Oxygen, which arrived some time after the airborne tests were done and which shows that it probably won't be much better than an Oxysaver cannula. The Oxysaver constant flow cannula works OK but the blood oxygen achieved at FL180 using the "18k oxysaver" setting is not good enough and for many people would be in the "headache" territory. This warrants further investigation - the author has used the Oxysaver cannulas successfully to FL160 for flights of several hours' duration and it's possible that the problem appears only above that level. The poor oxygen conservation performance of the Precise Flow system (a saving of just 20% over the constant flow Oxysaver cannula) is worrying but was double-checked by breathing through the system on the ground and the oxygen usage was within 10% of the airborne figure, for the same "18k" setting. It is also confirmed by experience of using both the PF system and constant flow Oxysaver cannulas on similar flights over the past two years; the oxygen usage appears to be very similar. Neither the MH nor the PF demand regulators are easy to mount in the aircraft. They can be strapped to a seat belt or similar but the result will be clumsy at best. Cockpit oxygen systems have the potential to make the cockpit look like an operating theatre, with tubes hanging everywhere, and more attention should have been paid to this aspect. Users of 4-seater aircraft in particular end up with a lot of pipes if carrying 3 or 4 people. 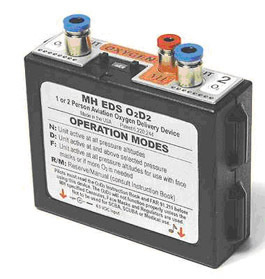 The MH O2D2 regulator has two outputs, has rectangular dimensions, and two of them could be mounted side by side without too much trouble, but the PF regulators are an awkward cylindrical shape which can be mounted only using fairly esoteric methods such as this one. There is little point in using a constant flow conventional (non-Oxysaver) cannula; it is just a waste of oxygen. 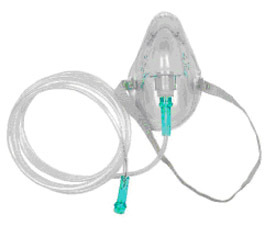 Based on a quick test, its oxygen usage is around double of the Oxysaver cannula. This article does not attempt to address value for money issues. The MH and PF systems are similar in cost per passenger, with MH being slightly more expensive. The MH cannulas are cheaper than the PF cannulas but this would be a major factor only if one was carrying a lot of different people. One can spend a significant money on a carbon fibre or Kevlar cylinder, though their cost has come down a lot in recent years. Finally, the cost can vary a great deal depending on whether one buys the equipment from the USA or from a UK reseller. Demand Regulators - Mountain High or Precise Flow? Another more general writeup on oxygen systems is here. Last edited 12th May 2010.